Breakfast just got reinvented with these sweet, tender, comforting, super nutritious Sweet Potato Breakfast Boats. They are crazy yummy & surprisingly quick to prepare! You all must know by now that I am ever so slightly sweet potato obsessed. Surely all of my sweet potato-ey recipes are a dead giveaway. They have been sneaked into everything from my Baked Mac and Cheese to my Sweet Potato Pancakes. They have even made it into cake! 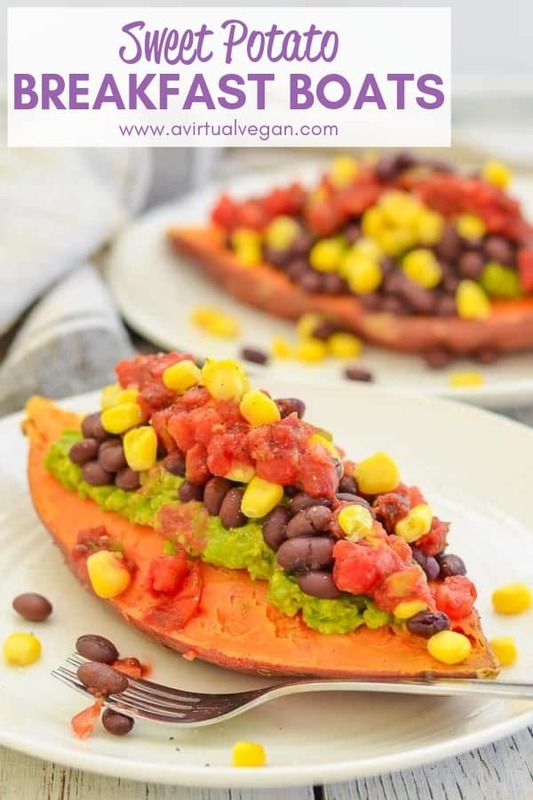 Well today they are arriving in Sweet Potato Breakfast Boat form thanks to the lovely Katie Koteen and Kate Kasbee and their new book Frugal Vegan. 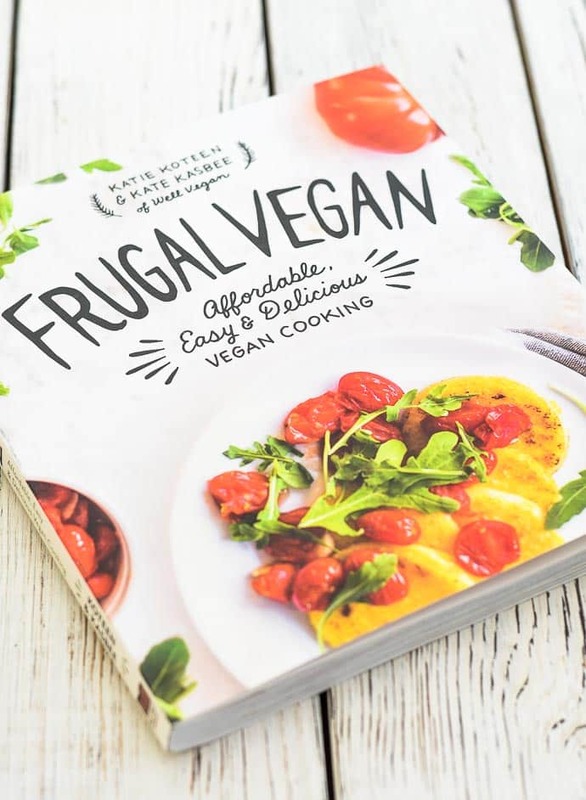 Frugal Vegan is full of super tasty, affordable, easy vegan recipes as well as practical tips to help you create stunning plant-based meals that will not only save you money, but save you time too. 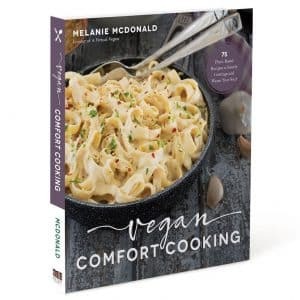 It’s the perfect book for people who like to cook simple, easy recipes. Nothing in it is complicated and you wont find any ‘out there’ ingredients. It covers all bases with breakfasts, snacks, salads, soups, entrees, sauces, dressings, desserts and baked goods and every recipe looks delicious. 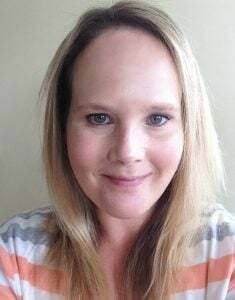 I have tried and loved the Pineapple Scones, Mushroom Stroganoff, Sweet Potato Steaks with Chimichurri Sauce and of course today’s recipe, the Sweet Potato Breakfast Boats. I had such a hard time deciding what to share with you today, that I ended up starting a little poll on my Facebook page to help me decide. These Sweet Potato Breakfast Boats won and I’m so glad they did as I really enjoyed scoffing them for lunch yesterday after taking my photos! And if that wasn’t enough: Crispy Vegan Bacon ???? Once you give this recipe a try let me know what you think in the comments below or share a pic on Instagram. Use the hashtag #avirtualvegan. 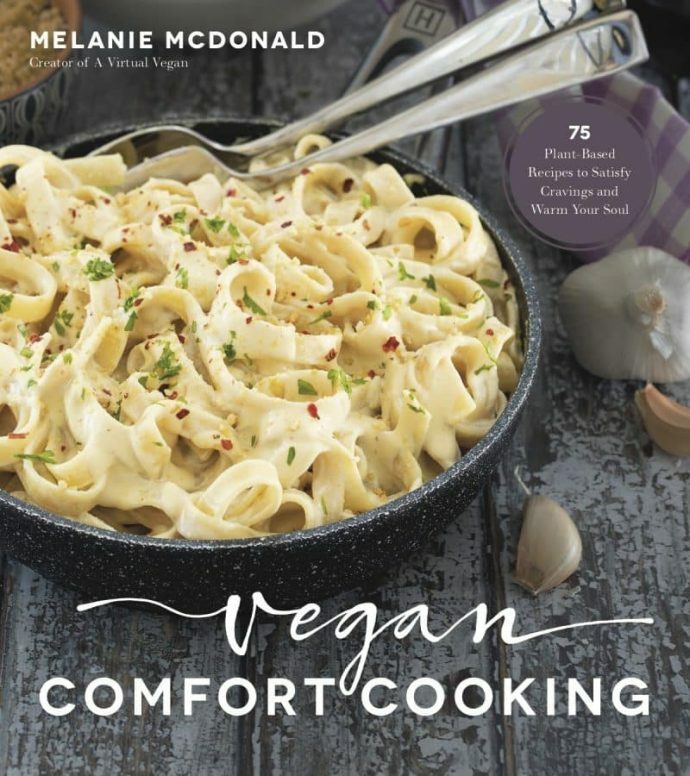 And if you want to get hold of a copy of the Frugal Vegan it’s available in all good book stores or you can pick it up from Amazon here without even leaving the house! Sweet potatoes are a delicious and versatile, yet often overlooked, breakfast food. They can stand in for toast when sliced thin, cooked on a cast-iron skillet and topped with avocado, and they offer a healthier way to do hash browns. Here, we make them into boats we can fill with our favorite toppings. We went with a Southwest theme for this recipe, but you can really use anything you have sitting in your pantry or fridge. Chickpeas, broccoli, bell pepper, spinach—get creative! Using a fork, poke holes all around the sweet potato. Place it on a paper towel or microwave-safe plate and microwave for 8 to 10 minutes, or until cooked through. Cut the sweet potato in half lengthwise, and then, with the fleshy parts facing up, cut a slit lengthwise down the middle of each half. Use a couple of forks to split open the sweet potato halves so you’re left with little pockets. In a small bowl, mash the avocado with the cumin and cayenne. 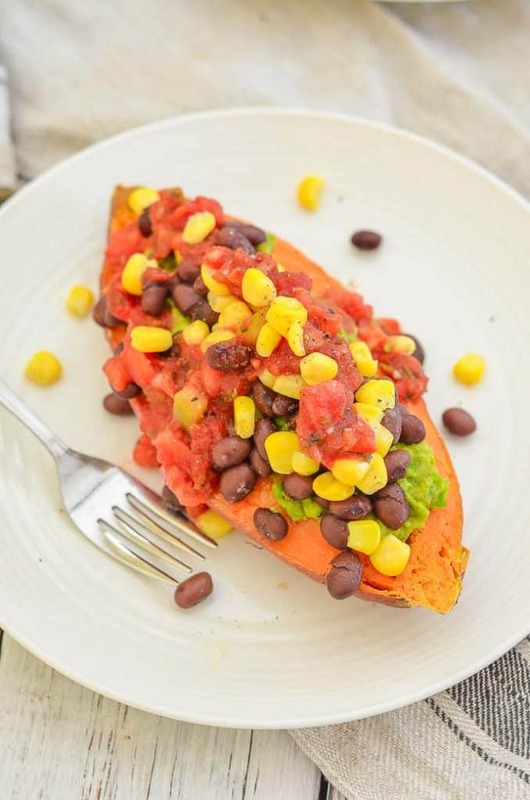 Then, fill each sweet-potato boat with the avocado, followed by the black beans, corn and salsa. Season with salt and pepper to taste. 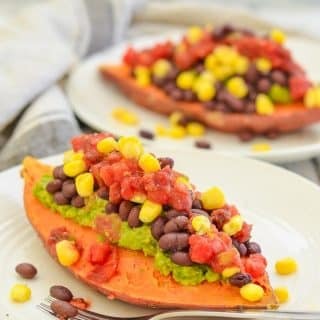 When I made this I used a whole avocado between the two servings and seasoned the sweet potato before I added the toppings. To prepare the corn just remove from the freezer and pour over some hot water. Leave for a couple of minutes then drain. Recipe from Frugal Vegan by Katie Koteen and Kate Kasbee and published with permission from Page Street Publishing Co. If I wanted to bake the sweet potatoe instead of using the microwave. What setting and time do you suggest? I would bake it at 400°F. Timing totally depends on the size. They vary so much. You’re looking at anything from 30 mins to an hour I expect. Just until a fork inserts easily. I don’t typically eat these foods for breakfast, but it sure does look delicious! I’ll have to give it a try! It’s great for dinner too. We had it the other night with salad! You had me at potatoes. Those look yummy! That book is wonderful, frugal meals that doesn’t taste like a budget. Exactly! It’s such a great book! 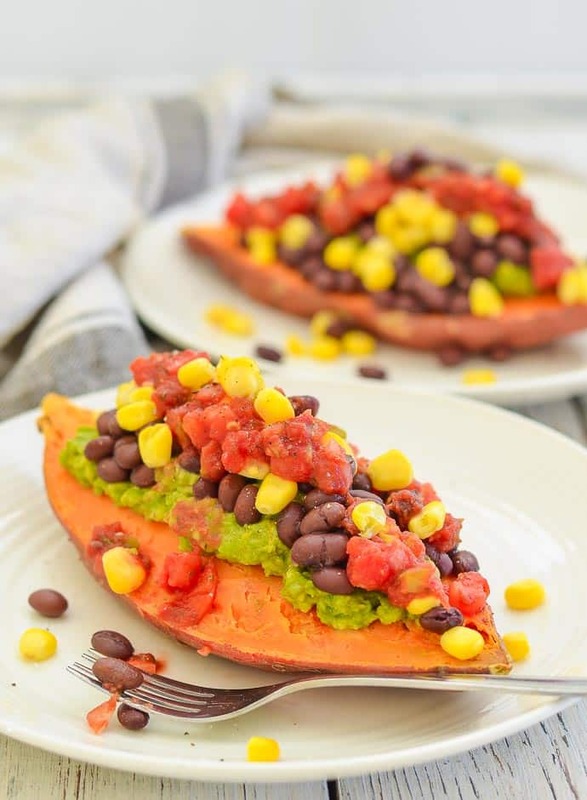 Sweet potato and avocado are a match made in heaven! Great dish! This is my kind of meal! Sweet potatoes just go with anything, right? !